At Protec, we serve home users and businesses of every size. Whether you work in industry, a government agency, or the healthcare field, our hard drive destruction services ensure that 100% of the sensitive data on your unused equipment is gone forever. Call today for more info! Data breaches can be a company’s worst nightmare. Tracking down exactly what information got out, who has it, and what they’re doing with it is a massive undertaking – not to mention all of the necessary cleanup steps that come afterward. The monetary and reputational damages incurred from even minor data breaches have destroyed entire companies. Every day, the data scraping techniques employed by scammers, thieves, and criminals of all types become more advanced – increasing their chances of stealing sensitive data (even from broken devices which haven’t been able to boot up in years). At Protec Recycling, we know that data security is a high priority for any person, company, or organization who handles sensitive information on a regular basis. We understand the implications of data breaches, no matter how big or small – and we take all the necessary steps to prevent them. Having your hard drives and other data-containing devices securely shredded by Protec Recycling is one of the best ways that you can actively prevent data breaches. 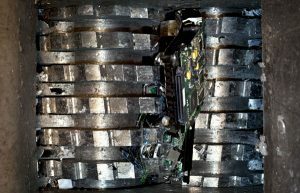 Why Should Hard Drives be Properly Destroyed? Personal Information – Many people don’t realize it, but even computers employed strictly for personal use are at risk of data breach. If you’ve ever used a credit card on your computer, handled tax information on your computer, or saved passwords on your computer, you are at risk for becoming a victim of data theft. Customer Information – Protecting any saved customer information is of the utmost importance. Even a small data breach can cost you thousands. Data thieves are clever enough to gather contextual information from a single breach that can cause a lifetime’s worth of headaches for your customers. The best way to handle data breaches is to never have one in the first place. Compliance – Government organizations are subject to Department of Defense and National Institute of Standards and Technology compliance when handling sensitive information. Healthcare professionals are subject to HIPAA regulations. Disregarding these laws can lead to massive fines and other punishments for those who are not compliant. Trust in Your Company or Organization – When customers or constituents feel that their data was improperly handled, it can take years, even decades to rebuild trust enough for them to interact with you again. Some never may. Apart from financial repercussions and the labor hours involved in sealing up data breaches, your company or organization’s very reputation is on the line when sensitive data is leaked. Whether you’re an educational administrator, involved in a government organization, a business owner, or just a private citizen trying avoid having your identity stolen – Protec Recycling offers a secure data destruction solution to fit your needs. In addition to our standard in-house capabilities, we offer on-site destruction and e-waste pickup. We operate under strict chain of custody procedures and observe all applicable compliance standards. Don’t run the risk of even a small data breach – protect yourself by entrusting your sensitive data to an industry professional with years of experience in the field. Call Protec today at 205-549-2120, schedule a pickup online, or visit our Contact Us page!